A few weeks into my first semester at Georgetown, I noticed an open music room—a rare sight in the perpetually busy student center—and made a mad dash to claim it. I sat down at the piano, giddy with the excitement of securing a room and relieved to be alone for the first time in weeks. I placed my hands over the keys and played a hesitant scale. After a moment, I heard a classical piano piece being played back to me. Was someone playing a recording down the hall? No, I realized, it was coming from the room next door. I immediately snatched my hands away from the keys. I wasn’t alone after all. 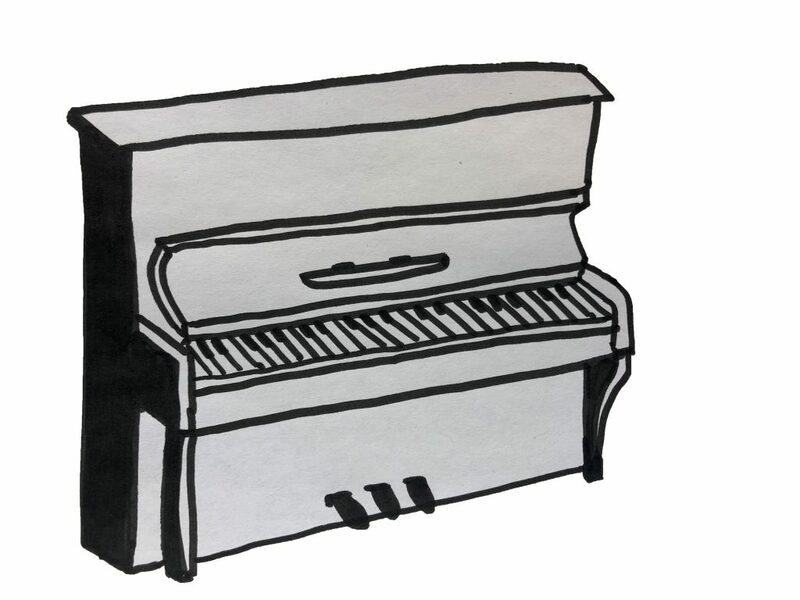 I sat hunched over that uncomfortable piano bench for the next ten minutes, playing bits and pieces of sheet music I had pulled up on my phone. But I couldn’t distract myself from the perfect concerto coming from the other room. If I could hear whoever was playing next door, they could certainly hear me. I couldn’t shake the thought of them laughing to themselves, silently judging me for being less than amazing. I scared myself out of the room, feeling defeated and unsatisfied. Still, for the rest of that semester, I couldn’t stop jumping at the chance to claim open practice rooms. I kept hoping that one day I would magically stop caring what other people thought and just be able to play. Instead, I shamed myself out of the room over and over again. If I saw the shadow of someone outside the door in my peripheral vision, I would switch to playing something more “advanced.” I thought I would be judged for taking up a practice room when I was far from a professional pianist. I felt the need to prove that I deserved to be in that space. This urge was particularly strong during my first weeks at Georgetown. I walked through the student activities fair and put my email down for everything I was interested in, from newspapers and literary magazines to dance troupes and a cappella groups. Everyone told me that college was a time to find new interests, develop new skills, and do things you would otherwise never do in your life. The thing is, Georgetown does not make this easy. Any extracurricular activity that requires showing up to an interview in business casual attire with three copies of your resumé in hand clearly isn’t interested in your lack of experience. The whole application process makes you prove your worth for a specific end-goal, whether it be pre-professional, social, or otherwise. Most clubs do not see their purpose as mere enjoyment or experimentation. I remember my freshman fall, walking into a workshop for a dance group to learn the audition choreography and immediately wanting to leave. There were eight people scattered around the studio, each person going through a stretch routine, looking like they’d done it a thousand times before. As we learned the choreography, I could see my flailing limbs in the reflection of the floor-to-ceiling mirror, struggling to keep up. I stayed the whole hour and a half, but only because my roommate (a trained dancer) wanted me to. Needless to say, I didn’t end up auditioning. It’s easy to feel like urges to try something new are stupid or misplaced when I’m surrounded by seemingly polished experts wherever I go. But there’s no shame in being an amateur. I shouldn’t need other people’s validation to do what I enjoy. The very notion that I have to be amazingly skilled at something to deserve to practice it is absurd. We all have to start somewhere. Equipped with this realization, I found other ways to dance on campus through Rangila, Reventón Latino, and Vibe_. Groups like Vibe_, which practices K-pop and urban dance, give people who have an interest or passion—but not necessarily the expertise—a space to explore and learn, and above all, just do what they like to do. My practice room fears disappeared when I found support for my “weird urges” in people who shared my love of music. They spent hours in practice rooms with me, playing around on the piano, sharing new artists, and just jamming out. I went there with friends to take a break from studying for finals or between classes to get a song out of my head and onto the piano. The more time I spent there, the more I saw those rooms like a hangout space for like-minded people rather than a space in which I had to prove my worth. Over time, I realized that I don’t need validation from others to do something I enjoy. There’s freedom in enjoying something without thinking about whether I’m good enough. It allows me to go after what I want and mess up, without doubt or insecurity weighing me down. I don’t have to be better or best or amazing or talented. It’s enough just to enjoy. Practice room hangouts have shown me that if I pursue whatever it is I’m pursuing with excitement, others will follow my lead. If I’m excited, they’re excited. If I don’t judge myself, they don’t judge me. When I sit in practice rooms today, I feel a sense of shared community with whoever’s in the room next door. Whether they’re singing a ballad at the top of their lungs, stumbling over the same few notes over and over again, or blowing through an impressive Chopin, we’re all there for the same reason. We’re excited about what we like and we won’t let anything stop us. My hands are staying on the piano keys this time. Joy Kim is a sophomore in the College majoring in linguistics and psychology. Some things she likes are beaches, bad dancing, and Flamin’ Hot Cheetos.